Disease prevention focuses primarily on dedicated planning and sound management practices that keep infectious diseases out in the first place and stop non-infectious diseases before they start. With this approach, the poultry owner and farmer place a higher priority on planning and expenditures for disease prevention than on short-term savings and stop-gap treatments, according to MSUCares, the Mississippi State University Extension Service. It is essentially a mental attitude that recognises the ever-present risk of disease and the fact that disease prevention does not cost. It pays, and many times over. Failure to concentrate on planned disease prevention often leads to personal disappointment and sometimes disastrous financial loss. A flock receiving good health security management is a delight, and a source of both pride and profit. Reduce exposure to disease organisms by proper sanitation and stress management. Increase bird resistance to disease by using recommended immunization procedures. Treat disease outbreaks with specific medications that are effective against the disease being treated. Diseases have consistently been a major limiting factor to profitable production. Some diseases result from egg transmission or organisms through the use of infected breeder flocks. Other diseases are brought into the poultry house by vectors like wild birds, rodents, parasites, and even the poultryman. Disease results when exposure combined with the virulence of an organism is greater than the resistance of the host. Disinfectants reduce the exposure time and number of organisms. Vaccines help build the natural resistance or immunity of the birds. Medications and drugs help battle the disease organisms after they have overwhelmed the birds' natural defences. Most diseases can be eradicated from the poultry flock by applying the basic principles of hygiene and excellent sanitation. Other diseases are not easily eliminated, but can be controlled by proper use of disinfectants and sanitisers. If not controlled, the potential for microbial contamination and spread of infectious diseases in the flock is always a threat to the success of any operation. Sanitation is a rather simple word, commonly used in our daily conversations to refer to the establishment of environmental conditions that are favourable to health. It is those management practices that actually prevent disease or contamination by disease causing organisms. For the most part, they are simple mechanical applications. They are not sophisticated and usually require little in capital expenditures. These management practices do require a positive attitude, a workable programme, and proper application. 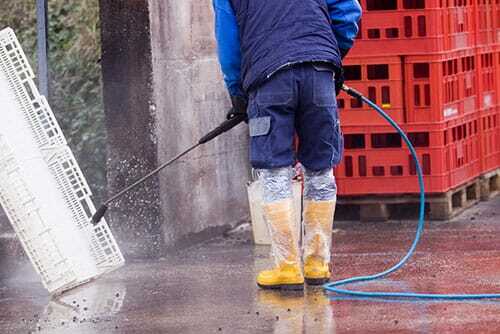 There is a practical way to clean a poultry house or hatchery. Each time, the process involves time, labour, energy, and money, so the job must be done correctly to achieve the best results. Disinfecting alone will not control disease, but combined with other disease control practices, will do much to reduce the incidence of many diseases. Vaccination is one of the more effective ways to prevent specific diseases. This is why we vaccinate poultry; so they are protected from explosive disease outbreaks. Viruses stimulate the development of better immunity than other types of microorganisms; so most poultry vaccinations are against viral diseases like Newcastle disease, infectious bronchitis, laryngotracheitis, fowl pox, and infectious bursal disease. Disease producing microorganisms can be classified smallest to largest as viruses, bacteria, fungi, protozoa, and parasites. All except the viruses are sensitive to drugs or antibiotics, so treatment against them is available when outbreaks occur. Because viruses are resistant to drugs and antibiotics, their control is fully dependent upon prevention through sanitation, isolation, and vaccination. Vaccination is basically the introduction of a specific biological substance (antigen) into the bird to stimulate the formation of a resistance or immunity to a particular disease. Usually the biological substance is some of the live disease organisms that you want to protect the bird against. The presence of these organisms in the blood stimulates the body's defence mechanism to produce antibodies that attack the disease causing organisms when the bird is exposed to them. Scientists have developed weakened (attenuated) forms of most disease causing viruses with little danger of causing the severe form of the disease. Even the killed form of some disease causing viruses stimulate the production of antibodies. In these cases, the 100 per cent safely killed virus is used. Short-term protection against a particular disease can also be given by vaccination with an antiserum that contains antibodies previously formed by animals that have been exposed to that particular disease. So-called vaccination outbreaks do occur periodically. 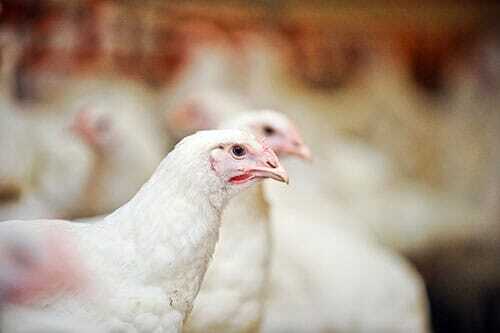 The factors influencing vaccine response in poultry are many, mainly depending on the host and environment. Seldom are all factors considered when vaccination programs are initiated. Ordinarily some protective immunity is produced when poultry are vaccinated, although the vaccine in itself cannot guarantee it. When vaccination failures occur, the total vaccination programme should be reviewed. Although vaccination offers a method of preventing many poultry diseases from establishing themselves, certain drugs and antibiotics are needed to help alleviate the symptoms of a vast number of diseases. The drugs make up an unassociated list of chemicals, and a great many are specific for a certain disease or for a group of similar diseases. New ones come on the market regularly and many others are in the process of experimentation. Drugs must reach the pathogenic microscopic organisms in the bird to be effective. Most drugs kill on contact, weaken the organism, or upset its life cycle. 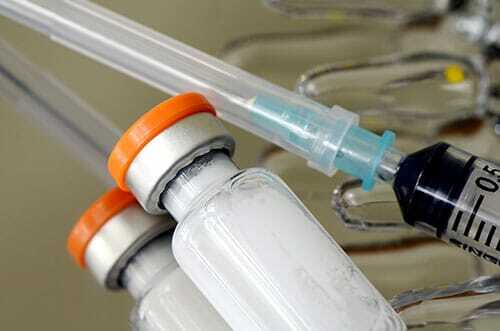 Drugs may be administered through the feed, in water, or by injection. Most drugs are chemicals that disrupt the life cycle of the organism involved. As most of the drugs are quantitative, their activity is determined by the amount administered to the bird. Some are effective when given in a large amount over a short period; others are better if given in small daily dosages over a long period. To be effective, the manufacturer's recommended dosage must be used. Any dilution will not produce the results anticipated. Some drugs produce excellent results from a disease prevention standpoint, but can have a harmful effect on the bird. Therefore, do not administer more than the recommended amount of any drug. When drugs are administered to a bird over a long period of time, particularly at a low level, certain species of bacteria become resistant, and finally the resistance becomes so great that the drug is ineffective. Resistance develops primarily to drugs that are absorbed from the intestinal (systemic drugs) tract although resistance to non-absorbed drugs like bacitracin has been documented. Antibiotics are used for disease control. Usually they are specific for those diseases caused by bacteria or related organisms. They are of no value against virus infections except to reduce stress on the birds caused by secondary bacterial/fungal/parasitic infections. The beneficial effects of antibiotics are due to their ability to disrupt various phases of cellular metabolism. An antibiotic will prevent bacterial multiplication, provided enough is present to attack all the bacteria present. If the amount of antibiotic is small and the number of bacteria large, the antibiotic will not produce its full effect. Antibiotics also act by changing the intestinal flora. Some drugs used in the poultry industry produce major effects in treating specific diseases; others are less valuable, and some are ineffective. In some instances the birds have become resistant, producing a change in the value of the drug. The diagnostic laboratory uses a technique known as a sensitivity test to determine which drugs are effective in treating a disease. The test actually shows which drugs are effective and those that are ineffective for treating the disease. Proper administration of medications requires that all precautions be followed as shown on the product label. Be sure that the dosage, route of administration, and required withdrawal period are observed. Use only drugs approved by the Food and Drug Administration for treatment of the specific poultry disease involved. Regardless of the products used, always keep an accurate record of all vaccines and medications administered to the birds. Record the dates, product lot numbers, and all other pertinent information that can be used to monitor the flock's health status. Remember that disease can affect all types of birds, and all types of people keep birds. By practicing health control in the flock, the producer also helps insure the health status of other producers located near him. Good neighbours are a valuable asset in the prevention and elimination of disease problems.